I have another flashback for you all today. The York Steak House was a chain restaurant back in the 1970s and 80s, primarily in mall locations, and that eventually closed its doors in 1989. The York Steak House that I remember most was the one in the Echelon Mall. It stood out among other mall restaurants in that pre-food court age in that it was open past regular mall hours. So if you wanted a late dinner after 9:30 PM or just regular dinner on a Sunday after five, and didn't (or couldn't) leave the mall, York was your choice. York was a cut above fast food, and a sit-down restaurant, so for a high schooler with a mall job, a dinner there was a 'dress nice' date. It ran cafeteria style, similar to the Rustler Steak House of the time, or the later Ponderosa. You picked your meal and paid at the cash register at the end of the line, and a waitress brought out your hot food. 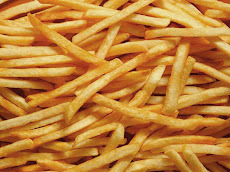 For potato offerings, you could get a baked potato, for which York would charge you extra for butter or sour cream, or you could get steak fries. Both had the vibe of being under heat lamps a bit too long. The steaks as I recall weren't bad. Does anyone else out there remember the York Steak House? Yes, I do remember York Steak House! There was one at Security Mall in Baltimore. I recall my mother taking me there to eat when I was a child, and later on it was a good place to take a date for something better than McDonalds!. I was really disappointed to see it go. The closest thing I ever found to YSH was Piccadilly Cafeteria, but they recently went out of business too. Shame, really. But for me the York Steak House will always hold fond memories of a much more carefree time. I remember it well. I worked there for three years in HS as a busboy/dishwasher/cook. Good dishwasher, lousy cook. I would burn myself on the grill and especially when taking baked potatoes out of the oven on a 30 pound rack. I still have scars on the insides of both arms from the burns. But I remember it fondly as my first job. Got lots of dates from among the hostesses. Made lifetime friends there too. I remember things like playing Jai Alai in the kitchen with huge mushrooms, kissing in the walk in freezer, and closing the store at 1:00am with the manager. Great food too. Sounds like you have some good, and bad, memories of the York Steak House. I'm from a suburb of Buffalo, and I used to eat here as often as my parents would let me (I was born in '74, so I was only like 5-12 years old in the heyday of this restaurant). I can still taste the chocolate pudding with the little...thingy placed on top of it for decor. It was like a little chocolate stick. I ate at a York Steak House in Middleburg Hts., OH in 1983 and one in Auburn, MA in 1993! The food was just okay in both instances, but I don't remember all the details. Dude I remember that exact same thing...the taste of that chocolate pudding with the stick on top. I was pissed when they closed...loved going there as a small kid in the early 80s. Worked at one in 87 in indiana. They had good food but it was outdated even then. I loved the York steakhouse rolls the best. I have never found a replacement or recipe for something similar. Anyone else have a recipe? Good memories of the grandparents taking us there. York had the best red wine salad dressing I ever had and miss it to this day. I remember the one that was in Fayette Mall (Lexington, KY) very well. On periodic shopping trips to that mall with my mother, brother and grandparents, it was THE place we stopped to eat before heading home. I would have been in grade school/early high school when we made those trips. I guess the last time I ate there was around 1986 or so (after my grandfather died) and I recall the "grown ups" remarking on the quality of the food having gone "downhill" and we just never ended up dining there again. By this time, I had my own car and these family excursions had just stopped. I don't think it was too many years after this that this particular location closed. I sure miss the York Steak House. When me, my father, and my step-mother went to this shopping mall, I always wanted to eat at York Steak House because the food was really good and the restaurant had a great atmosphere. The food was very good. Too bad they are no longer around. I sure miss York Steak House. 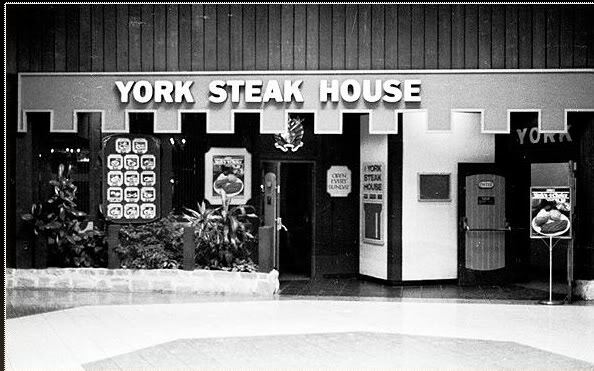 Back in the day when me, my father, and step-mother would go to this shopping mall, I always requested to eat at York Steak House. Either my father would give me money to eat there, or we go eat there together. THe food and atmosphere at the restaurant was great, and I loved the way they had the dining room. Looked very relaxing.